If you are looking for a marine park at the west coast of Peninsular Malaysia, head for Pulau Payar Marine Park which islocated 19 nautical miles south of Langkawi Island. If you are coming from Penang Island, it is located 32 nautical milesnorth of Penang Island. 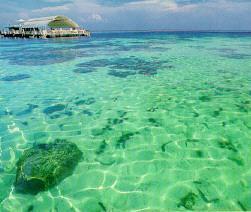 It is also approximately 15 nautical miles west of Kuala Kedah. This island still remains unspoiltuntil today due to its status as a marine park. No fishing or killing of fish. No collecting of corals or other marine organisms. No collecting of sand, dead shells or dead corals. No building or erecting any type of structure on the water. Keeping strictly to these rules and regulations will ensure that this park will remain unspoilt for many years to come.Comprising an uninhabited islands of Pulau Payar, Pulau Lembu, Pulau Kaca and Pulau Segantang, this park is surrounded bycoral reefs and many kinds of endangered marine species. Payar Island is the biggest island in this park measuring 2 km by 1/4 km. The Marine Park Centre which provides information on the marine park is located in Pulau Payar. Snorkelling, swimming and scuba diving are the main activities that you can do here. Being a marine park means that most of the marine life and vegetation in the sea are still thriving here. The popular diving site is known as Coral Garden and is located at the south-west of Pulau Payar where you will be able to see the bright and multicoloured soft corals. Thefascinating feature of this park is that there are many artificial reefs built from old boats, concrete blocks and tyres that have developed into mature reefs with plenty of sea creatures around them. Visibility on a good day can go up to 15m. Jungle Tracking is another activity that you can do over here. There are 2 trails that you can use to explore theflora and fauna of Payar Island. Baby Shark Feeding will be a memorable experience to do for you and your children. See the video of shark feeding in Payar Island. Floating Platform is designed for those who does not want to wet their bodies but still want to enjoy the marine lifehere. It is a platform called Coral Langkawi which is moored off Pulau Payar. Measuring 49 m by 15 m, you will have to booka package tour in order to have the privilege of using it. It has a tunnel shape chamber at the bottom of the platform 10feet below the sea. There are also boats which have glass bottom for you to see the marine life and corals as you move alongthe coral gardens. This platform is also equipped with a snack bar, a dining area and a sunbathing area. Other facilities provided in this park include picnic tables, barbecue pits, gazebos and restrooms. As there is no facility for accommodation here, most visitors will plan to spend a day trip here and stay in the hotels in Langkawi Island or Penang Island. It takes approximately 50 minutes using catamaran or speed boat operated by Langkawi Coral from Kuah Jetty in Langkawi Island. If you are coming from Penang Island, the journey will take approximately 60minutes. Another option of coming here is using the boat from Kuala Kedah in Kedah. Booking for a day's trip usually include pickup from hotel, lunch, use of snorkelling and diving equipments. Two dives are arranged. Total time that you need to allocate for this trip is from 8am to 4:30pm. For safety reason, details such as passport numbers, date of birth and full names need to be provided in advance before going for the trip.